Spinning turbulently, a mishmash of prints and bright colours pass before my eyes: rainbow polka dots, eighties graphic paint splodges and paisley in subdued jewel colours begin to merge amidst a sea of rayon, nylon and poly-cotton. Constantly turning, whilst new hands reach in for a vintage find. Everyone searching for their kilo, hoping to land on a unique find. Until a month ago, I’d never heard of the Vintage Kilo sale. Despite buying the occasional vintage item, I didn’t know you could buy your vintage based on its weight until Vintage Kilo’s event manager, Jenessa, invited me along to try out the concept for myself. Jenessa had noted my love of thrift and, excited by this new (to me) concept, I happily accepted her invitation to come and hand pick a kilo of vintage. As the name suggests, Vintage Kilo events allow you to select a kilo of vintage. 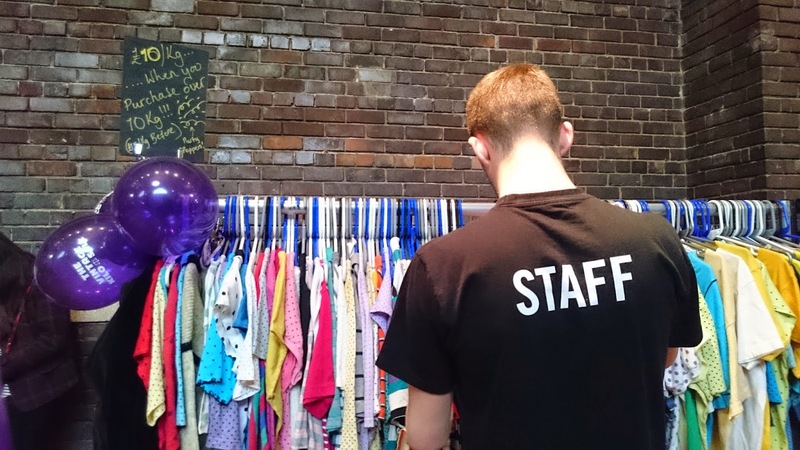 For £15, it’s fair to say, you could come away with a handful of new items to spruce up any vintage loving wardrobe. Arriving at the venue shortly before opening, crowds had already started to gather outside Liverpool’s Metropolitan Cathedral. 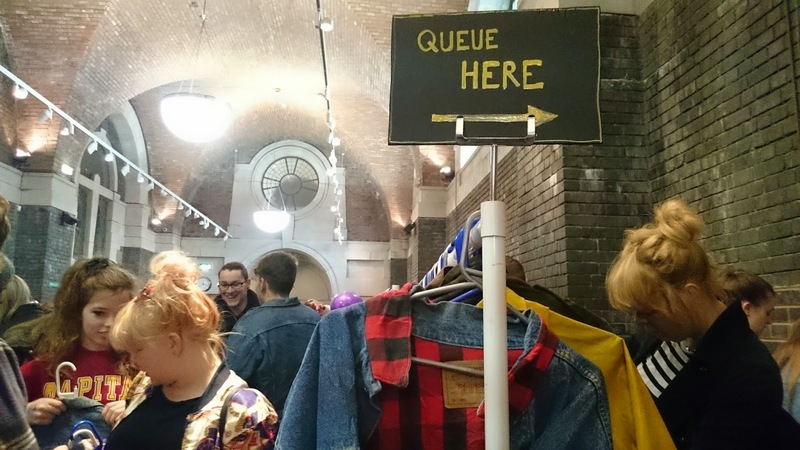 A mixture from all walks of life: university students impeccably dressed in 90s grunge, vintage loving women donning headscarves, overly hip hipsters mingling into families with pushchairs. As I was treating my mum to a pre-Mother’s day jaunt, we decided to head for a coffee to prepare us for what lay ahead. After latte and a short wait in line, we descended the crypt’s stairs to enter the unknown; an entire room filled to the brim with rails of vintage. 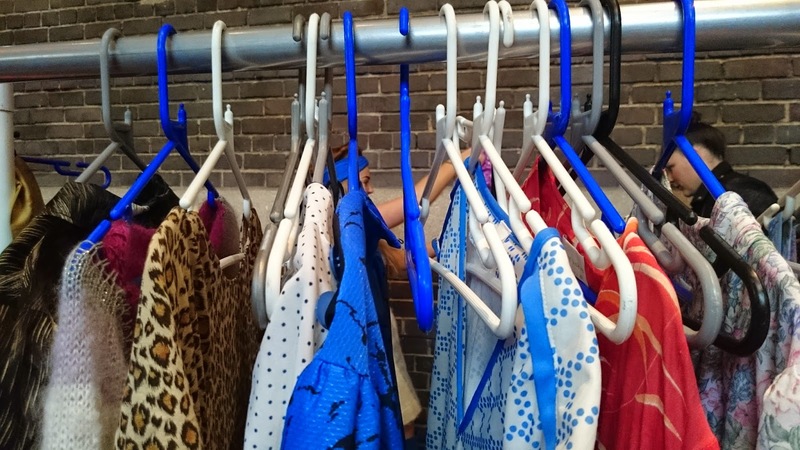 Thinking tactically, we decided to choose the dress rail as our first stop. We were greeted by a lot of Eighties style dresses and I was treated to my mother reliving tales of her, ‘Human League dress’ …just like the one on the rail. It was apparent by my empty purple bag that this era just wasn’t my scene (hey, I remember it the first time round!) but as I started to ease my way out, my eyes were hit by a rainbow of colour: blue with stripes of red, yellow, blue and green. Neglecting to look at the size, I placed it into my bag. 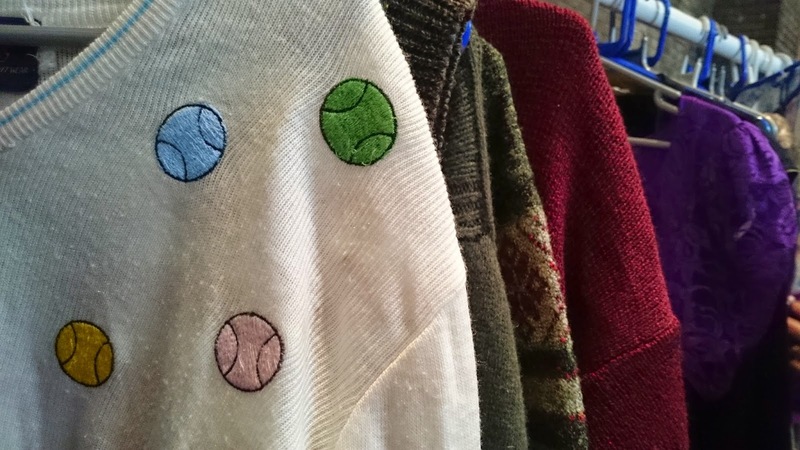 With thrifting, I’m learning that you can’t simply shop for a look- if you’re lucky, it’ll find you but I wouldn’t bet on it. Before heading out, I like to make a mental note of the clothes I’m looking for – what will build the look I’ve got my mind set on. Right at the top of the list today was a striped or paisley shirt, I wasn’t fussy. Both myself, and my mother, rummaged in the shirts tub (all the while having clothes thrown over and on, yes actually on, our heads as we delved deeper) to no avail. 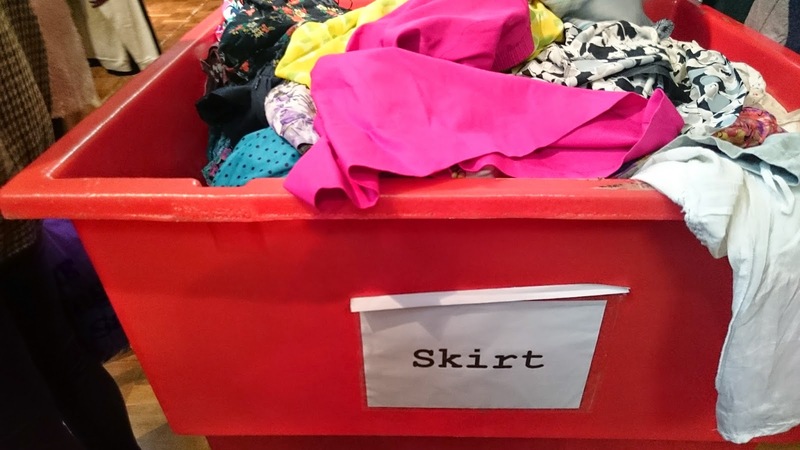 With one dress in the bag, it was time to check out skirts. Sitting pretty, I spied a wrap skirt which brought back a whole load of memories. In summer, John and I stumbled upon an amazing vintage boutique in Ljubljana. Run by Barbara Por Hrovat, a woman with a distinct love of 50s rock and roll and red lipstick, her boutique was so finely curated I wanted to live there. It was there I fell in love with a reversible wrap skirt that was oh so pretty but oh so tiny! Although it wasn’t exactly the same, the red floral wrap skirt I bought today has made up for Ljubljana’s disappointment. Before long, our parking meter was almost up and it was time to discover if the contents of my bag was a kilo. In the queue, along with my mother, we deliberated over which item wouldn’t make the cut if we were over the kilo. We needn’t have worried: three skirts and a dress made up 0.75 kilos. Kindly the girl at the weighing station offered me a final chance to fill up my kilo, but I was happy to hand over my voucher and leave with my finds. 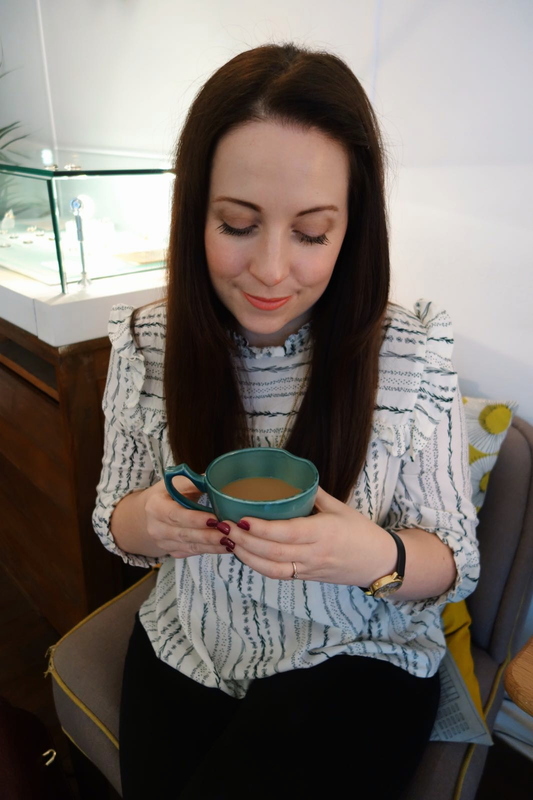 I’ll be posting my finds in a thrifty outfit post, but you’ll find sneak peaks over on my Instagram. 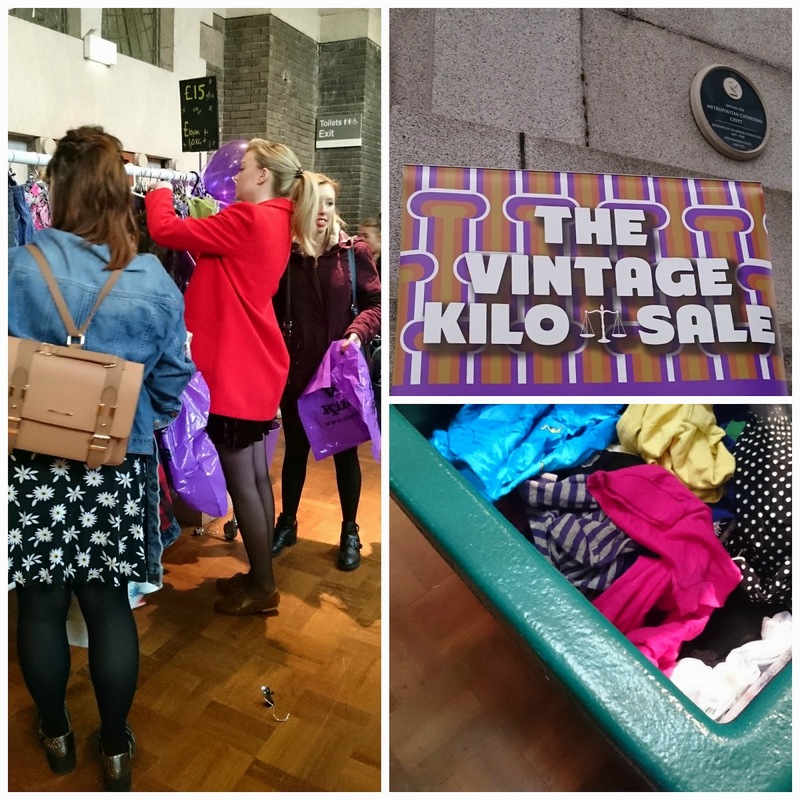 If the Vintage Kilo sale arrives in your nearest city, book the day off work and visit! Whether it’s the thrill of the unknown find, or the bargain prices, both my mother and I thoroughly enjoyed ourselves and have vowed to return. If you fancy trying it out, there are events running throughout April and May all over the country, check out their Facebook page for dates. 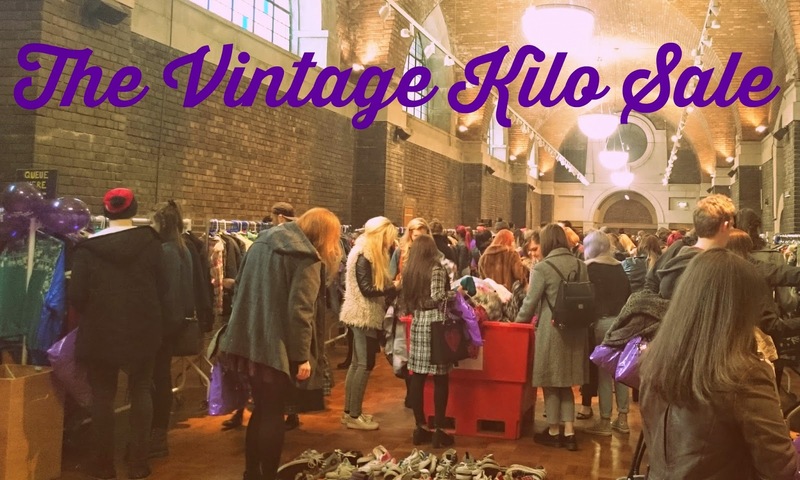 Have you tried the Vintage Kilo sale yet?